We've gone over what a gradation report means but you might ask yourself what exactly the gradation test is. In the laboratory the technician weighs out a predetermined weight of aggregate and it is separated by sieve sizes. There are several ways to do this. The least used of these methods is to shake the material over each sieve by hand. This can be extremely time consuming and is absolutely no fun for your technicians. 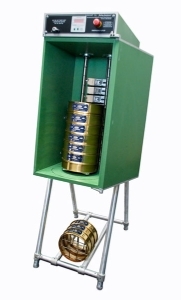 Most laboratories use machines to mechanically shake the sieves. This is not only faster but more reliable since the machine is much better at shaking the sieves at a constant rate than your technician is. Coarse Aggregate samples are most commonly shaken on a Gilson TS-1 testing apparatus as shown below. Coarse samples contain a larger volume of rock than fine aggregate samples do which means that you need more surface area on the screens to assure that all material has the ability to pass through each screen. The TS-1 has larger screen surface area than the round sieves that I will mention later. Typically you will use the TS-1 to screen rock from 3" to #8. Each of the trays shown in the picture above has a screen cloth attached to it, with the largest screens on the top and decreasing in size as they go down. 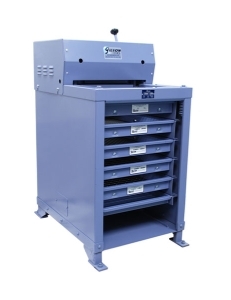 A sample is deposited in the top of the machine and the sample is shaken for a predetermined amount of time. Afterwards each tray is removed and the material retained on each sieve is weighed to determine the gradation of the sample. If you have a "mixed" sample, which means that it contains both coarse and fine aggregate (like base rock) you can still process the fines after using the TS-1. The fine materials will pass through all of the screens and collect in a pan at the bottom of the machine. By testing these fines with rounds sieves you can determine the rest of your gradation. The Retsch shaker moves the sieves in three directions in order to facilitate the material passing through the sieves. The Ro-Tap has an arm that hits the top of the sieve stack in order to "pop" the material off of the screen and move the sample around the screen cloth. The Mary-Ann hits the sieves from the side which "pops" the material much like the Ro-Tap but the impact also rotates the sieves slightly each time. You probably won't see many simple shakers like the Retsch and will most likely be at a laboratory that uses either the Ro-tap or Mary-Ann style of shakers. My personal preference is the Mary-Ann style shaker for a variety of reasons. This is the quietest of all of the shakers because it has its own enclosure. Don't get me wrong, it still makes a lot of noise but I feel that it is quieter than the other types of shakers. 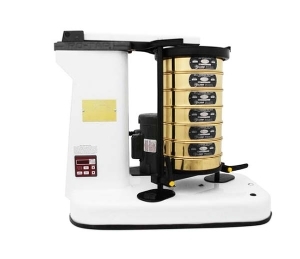 In addition, it allows for either 8" or 12" sieves which gives you the ability to process samples more efficiently and/or faster. I also prefer this setup because it does not damage the sieves. It's been my experience that the Ro-Tap can damage your sieve frames if they are not set correctly when you start the machine. The vertical impact to the sieves from the Ro-Tap arm can bend your frames if they are not perfectly level. 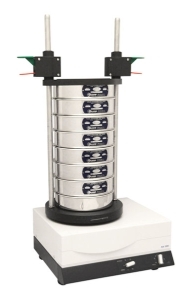 The bent sieves can become difficult to dislodge from each other and will either slow down your technician or force them to contaminate a sample. The Mary-Ann on the other hand uses a horizontal impact that is not as strong as the Ro-tap's impact and does not seem to damage the sieves. Round sieves can sieve material from 2" down to #200 but will usually only be used for 3/8" down to #200s because the larger size rock will need more surface area to sieve efficiently. The 12" diameter sieves can help you sieve larger rock because of the greater surface area and it can be possible to sieve up to 1" without an issue of efficiency with these sieves. Which apparatus do you use? What do you like/dislike about it?